He’s a curious comedian is Robin Ince, always absorbing one book or another, seeking answers to how everything works. In stand-up, too, he’s created nights celebrating everything from bad literature to the secrets of the universe, part of his collaborations with Professor Brian Cox, his co-host on Radio 4’s Infinite Monkey Cage. Whether he’s a polymath or a dilettante, his interests are wide and his enthusiasm for learning apparently bottomless. On stage, he’s often described as having the demeanour and the dress sense of a scatty sociology professor, an image he does little to dispel. In his new book, I’m A Joke And So Are You, Ince turns to actual -ologies as he puts that voracious appetite for knowledge to good use. He also does a lot of what the best art – including comedy – does: amplifies his personal experiences to illuminate the greater world. The premise is that he considers many of the clichés about comedians which, conveniently, academics often probe, and considers them in both the context of his own life and for humanity as a whole. The upshot is a wide-ranging book that’s dense with ideas – every page, if not every paragraph seems to raise a new theory. But the personal touch and a witty, uncomplicated and conversational writing style makes it a deceptively easy read. Of what makes someone a comedian, Ince queries whether it’s nature or nurture, including whether can be attributed to a single inciting incident. He shares a traumatic event from his early life, when he was involved in a car crash that left his mother in a coma, but is wary of attributing everything to that one moment. However, Eddie Izzard does ascribe so much of his drive to losing his mother early. What of the psychology of seeking approval from strangers, with its addictive highs and crushing lows? What brain chemistry kicks in that gives comics inspiration in the crucial moment? Ince considers the ego and the id via the ventriloquism of Nina Conti; the nature of someone’s real personality against the various personas we all adopt – again, comedians providing a heightened example of this given their well-honed stage projections of their personality. He’s surprised to find so-called ‘imposter syndrome’ is rare among fellow comedians, even though he confesses to often feeling like he doesn’t belong among his peers. A general anxiety is more widespread, Ince contributing another chisel blow to chip away at the taboo around mental health. Many will surely identify with his description of the sometimes toxic voices in his head and his suicidal thoughts. Here, these become more fuel for his investigation into the human psyche. ‘I’ve always been an over-thinker,’ Ince writes, and while that’s not always been healthy for him, when he points that outwards to harvest knowledge, the result is this fascinating tome. Nor is the scope entirely psychological; a chapter on offence in comedy featuring Tim Minchin (whom Ince holds up as an exemplar of the well-balanced comedian) and Ricky Gervais, who Ince famously supported on tour, probes the sociological effect of gags, whether as release valves for tension or as weapons of oppression. The former is brought into sharp focus in the final chapter as he considers death, including his own conflicting emotions in rushing between comedy gigs and his mother’s deathbed. There is no single conclusion to this book, but a powerful take-out is comedy’s ability to connect people, to share pain and difficulties and to find empathy in similarities. ’Laughter is the shortest distance between two people’ Victor Borge famously said. Though humour can, of course, also be used to divide and belittle anyone considered ‘other’. Drawing on so many sources, and considering so many topics. I’m A Joke And So Are You is one of the best books ever written about what it means to be a comedian, mainly because it’s not satisfied to be just that. It’s certainly a must-read for anyone interested in the workings of comedy and comedians., but probably for anyone interested in the workings of human beings in general. 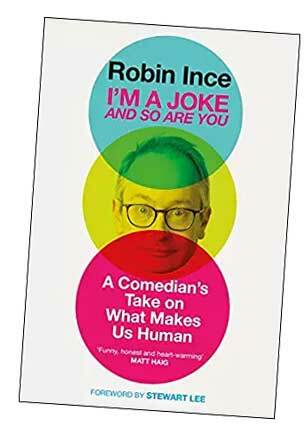 • I’m A Joke And So Are You by Robin Ince has been published by Atlantic Books priced £16.99. It is available from Foyles at full price, or from Amazon at £10.93. Click here for Chortle’s interview with Robin Ince about the book.